Dango Hostel is just across the street by the beautiful My Khe Beach. It is situatedat one of the most preffered area of Da Nang city, surrounded by famous cafes, restaurants, beauty & spa centers, supermarkets and a local fresh fruit & vegetable market. At Dango, you will have the chance to live in a select setting, finding your prefferencies whether it is complete privacy or engagement in a homelike ambience, meeting people and travellers from around the world. The number of 15 rooms are assigned into – large single bed, double bed, family room and dormitories, where we can comfortably accommodate you for a short or longer period of time. 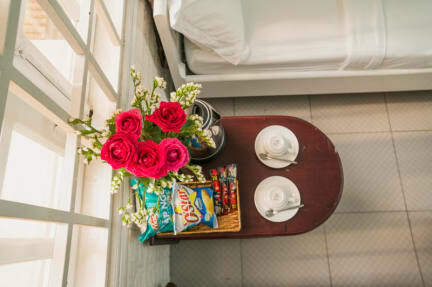 Apart from the many facilities like air conditioning, free Wi-Fi, laundry service, towels, ameneties, hairdryers, room cleaning, private bathrooms, smart TV and small refrigerator for all rooms (except dorm), you can also enjoy at our ravishing Cafe and Bar by the lounging area. Amazing staff (ALL of them ) smiling , helpful , friendly .. this hostel feels like home. Thank you for having helped me to make my stay happy and just perfect. They has helped me out to organize my day in such a way that it was amazing ... Cosy atmosphere which makes it easy to meet up with people. Perfect location to get to beaches. Superb hostel!! I just stayed here one night coz i had had other plans in Hoian. But its awesome than i expected. Lovely and helpful staffs, tasty breakfast, cozy and clean room. I gonna stay here again when i come back!! Great staff with brilliant English, always available to give you a hand with any request you have. Breakfast is pretty poor but it'll get you by for the first couple hours and the hostel is a stone's throw away from the beach and streets with great bars and restaurants. Really enjoyed my stay. Staff was super friendly and the place was clean. I booked a dorm bed for two days when the hostel wasn't busy, but instead of sticking everyone who was there in the same room(s) to reduce the cleaning, they kept us separate so I still got to have my own space. I slept awesome. They have a lot of different breakfast options that you select the night before- I tried two different Vietnamese breakfasts and both were really good. I would definitely stay here again. Overall a good stay, staff were very helpful and location was ideal, round the corner from the beach. Our room had a balcony which was nice, however there was rubbish left on it. Fine place for a quick stay on the way to Hoi An. The room (4 bed dorm) was pretty disappointing as it was teeny tiny. There was just not enough room for anyone’s things and the air con (turned on at 7pm) was really weak so it was quite warm and stuffy. The room was 8 flights of stairs up too. I was expecting much better for the price I guess. The staff was really nice and helpful at the front desk! The beds were clean and comfy and it’s in a good location with lots of places to eat near by.